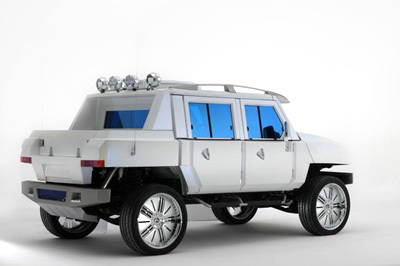 Unveiled at the 2005 Bologna Motor Show, the Fiat Oltre is a luxury 4x4 concept SUV built on the Iveco LMV (Light Multirole Vehicle), a vehicle going into service with both the British and Italian armies. 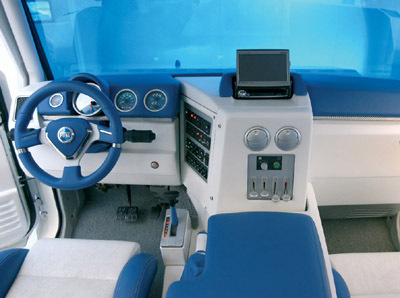 The Fiat Oltre concept is a crew cab version, and features a four / five seat cabin with a smaller load bay behind. 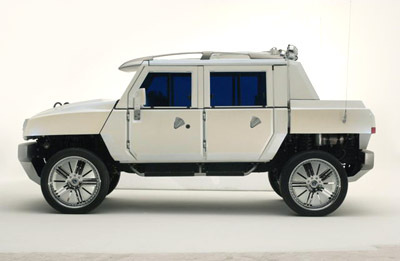 The Hummer-esq styling and proportions means the Oltre is not a nimble vehicle. That is ensured by a seven tonne full weight, hauled by a somewhat-underpowered-sounding 185 bhp 3 litre 4 cylinder. Although it does have a respectable peak torque of 336 lb ft @ 1800 rpm. Despite the road-going low profile tires, the Fiat Oltre concept does have some off roading technology, including; permanent on-demand all wheel drive, locking differentials, a six speed automatic gearbox and a rather useful 50 cm of ground clearance. All this means the Fiat Oltre is capable of taking on lateral gradients of up to 40% and longitudinal gradients of 80%, as well as negotiating water up to 85cm deep, 1.5m if you care to fit the extra inlet and exhaust pipe extensions. The exaggerated utilitarian styling of the concept Oltre would certainly need to be toned down if Fiat was ever to introduce the model. Unfortunately this is the only thing separating the Oltre from other luxury SUV clones. 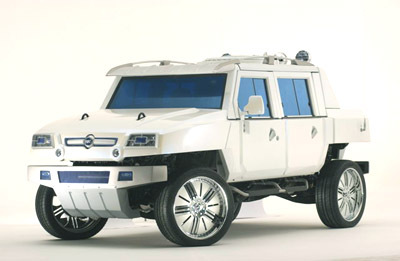 Except the Hummer of course.